It’s the all too common lament of parents during the holidays. From the moment they wake, our children’s default setting is to get on a screen. To make us feel worse, the children’s commissioner, Anne Longfield, has warned that our children’s insatiable consumption of social media is as bad as letting them gorge on junk food. Yet Robert Hannigan, the former director of GCHQ, says screen time may not be as bad as we fear. “If you appear to be spending your holiday unsuccessfully attempting to separate your children from wifi or their digital devices, do not despair,” he says. “Your poor parenting may be helping them and saving the country.” As he points out, we need future spies with cyberskills who are digitally literate. So how are parents supposed to proceed? Longfield says we should look at our children’s screen time as we might their diets. Just as we make them eat their five a day we should also make sure that their use of screens is healthy. If they’ve climbed hills, visited museums, fed the cat, been model citizens all week, surely we can permit a reward binge? Actually, no. Elaine Halligan, the London director of The Parent Practice, says: “If they’ve had a splurge one afternoon, they’re going to ask for it again and again. 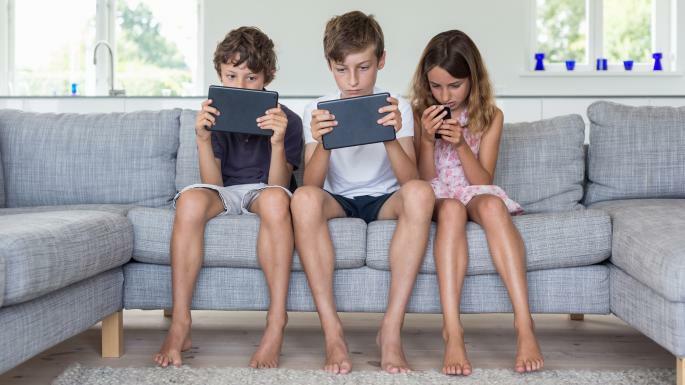 Likewise the approach of no screens all week and unlimited use at the weekend doesn’t teach moderation, and makes it harder for children to develop good habits. If their time is unlimited, they become so wired that they can’t detach. Graham says that physicality and the outdoors are “splendidly immersive”, even for a sulky teenager who doesn’t want to go out. “But to say, ‘Let’s go for a walk’ will not engage.” Have a lure, be it a swim in a pond, crabbing, tree-climbing. “Even starting the journey of getting out with, ‘We’re going to play hide and seek in a wood’ has a bit more gamification attached to it than walks and ice creams.” The holy grail, he says, is a camping trip (so much to do, bad reception).